They patrol the dark and dangerous streets, seeking out criminals and villains, veiled in secret identities. 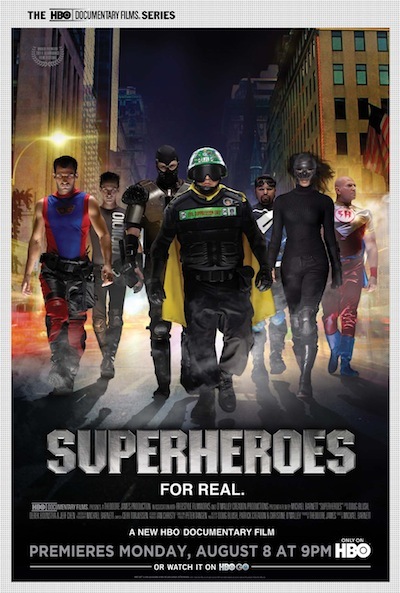 They call themselves real-life Superheroes (RLSH), and they are out to save humanity. From New York to San Diego, the exclusive HBO documentary Superheroes profiles real-life caped crusaders who don masks, homemade costumes and elaborate utility belts to battle evildoers everywhere when it debuts MONDAY, AUG. 8 (9:00-10:30 p.m. ET/PT), exclusively on HBO. HBO Documentary Films presents another weekly series this summer, debuting a provocative new special every Monday through Aug. 15. Other August films include: "Koran by Heart" (Aug. 1) and "Gloria: In Her Own Words" (Aug. 15). The film spotlights several of the country's most famous masked heroes, including San Diego's Mr. Xtreme and the members of Brooklyn's New York Initiative (N.Y.I.) as they guard city streets with the goal of deterring violent crimes. Superheroes also features interviews with: Stan Lee, legendary comic-book writer and former Marvel Comics chairman, who co-created Spider-Man, The Fantastic Four, The X-Men, Hulk and Iron Man; Lt. Andrea Brown, a 24-year veteran of the San Diego Police Department; and Robin Rosenberg, a clinical psychologist and expert on the psychology of Superheroes, both real-life and fictional. Whether they actually protect the public from crime or are just oddball vigilantes, the vast majority of these men and women are motivated by a heartfelt desire to fight apathy and the so-called "bystander effect." Some of the Superheroes profiled in the film were inspired by the widely reported 1964 murder of Kitty Genovese, in which neighbors heard the victim's screams without coming to her aid. Others decided to turn their lives around after struggling with violence, depression or addiction. Many RLSH channel their energies into doing a variety of good deeds, from giving out food and water to the homeless, to organizing toy drives for children in shelters. Mr. Xtreme, a 33-year old man of conviction and purpose, with a loathing for apathy and indifference. He sets out on nightly patrols in his hometown of San Diego to deter violent crime before it occurs. An imposing figure of neon and camouflage, Mr. Xtreme will stop at nothing to protect his community from the villains and goons who reap fear throughout greater San Diego. Zimmer (N.Y.I. ), the only unmasked superhero in the documentary. A twentysomething gay man, he feels he needs to be as open about his RLSH identity as he is about his sexuality. Zimmer's no-frills uniform consists of black pants and a basic grey tee. Lucid (N.Y.I. ), who settled in Brooklyn to lend a helping hand to the N.Y.I. and assist in "bait" patrols. Big, strong and nomadic at heart, he wears the pain, joy and experience of his life as tattoos, and can be heard saying, "I've hurt enough people in my life, now it's time to give back." T.S.A.F. (N.Y.I. ), pronounced "Saf," which stands for "The Silenced and Forgotten." Enigmatic, beautiful and fierce, T.S.A.F. brings an unparalleled passion to her work in the N.Y.I. as she puts herself in harm's way. Master Legend, whose outsized personality and over-the-top energy are exceeded only by the sincerity of his convictions and the enormity of his heart, which he puts to near-constant use in his community of Orlando, Fla. Dark Guardian, who stands alone as a beacon of light in the shadow world of street drug peddlers. Seemingly unafraid, he heads out to parks where drugs are being sold in plain sight of children, and does everything in his power to drive dealers away. Life, who selflessly works on behalf of Manhattan's homeless population, delivering the smaller necessities of a life lived on the urban streets while minimally costumed in a mask and tie-and-jacket. In addition to its premiere at the 2011 Slamdance Film Festival, Superheroes screened July 23 at this year's Comic-Con International in San Diego. Superheroes is directed by Michael Barnett; produced by Theodore James in association with Freestyle Filmworks and O'Malley Creadon Productions; co-written by Michael Barnett and Theodore James; executive produced by Doug Blush, Patrick Creadon and Christine O'Malley; edited by Doug Blush, Derek Boonstra and Jeff Chen.